Coming back in 2020 with a fresh new look! Each year, Inchgarth holds it's Annual general meeting (AGM) & Margaret E Morrison spirit of the community awards to celebrate all that is positive in our community and to recognise the achievements of the unsung heroes who give their time selflessly- making a difference to the lives of others. It is an evening of music, food, cheese & wine, awards, networking, dance, entertainment, celebration and attended by the highest civic, business, charity, community leaders of the city and most importantly YOU- the public. People come from all over the city and beyond to attend this FREE and amazing evening. You are all welcome. 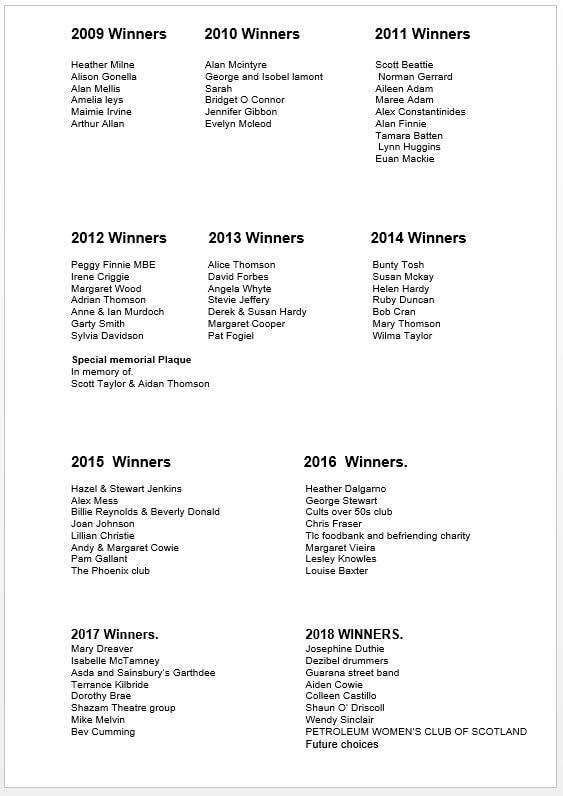 Unfortunately, the 2019 Spirit of the community awards will not take place this year, but fear not, it shall return in 2020 with a whole new look, as powerful as ever, and another group of wonderful people being recognised for their amazing achievements. We look forward to bringing the spirit of the community awards back after this opportunity to bring in some positive changes and all will be revealed at a later date. Thank you for your tremendous support over the last 10 years of the Spirit of the community awards, it has been outstanding as have the award recipients, and like we said, it's not finished.....it's just coming back with a whole new look in 2020. Inchgarth management. The Garthdee spirit of the community awards and our AGM was named after Margaret E Morrison, sadly now passed, who was a well respected long standing Inchgarth user and board member of the centre. The awards and AGM showcases all that is positive about people volunteering in our community and centre, it also showcases Inchgarth's fantastic programme and services and why Inchgarth is the cities, busiest, biggest, best and most successful centre. INCHGARTH COMMUNITY CENTRE AWARDED AN MBE! The Queens Award For Voluntary Service- the MBE for a community group. The highest award in the UK for an organisation.